My name is Gill and I'm from Cork, Ireland. I feel I have to let you know of my amazing experience seeing Luka play last Thursday night in Killarney. I'd normally see Luka play in De Barra's in Clonakilty, Co. Cork, but made the journey to Kerry for a change. The Granary is a lovely small intimate venue and the sound there is great. Luka had a girl from Boston called Meg (didn't get her surname) on as a warm-up act, she was fantastic, very talented altogether, writes all her own songs and has a beautiful voice. He came on stage after 9pm and started his set with Sunny Sailor Boy, I think initially the crowd were a bit shy and didn't participate as Luka would be used to in Clonakilty. In all the times I've seen him play I've never seen him play such a varied mix of his songs. I didn't get the songs in order but he played "I'm not at War" which I've never heard him sing live, you could've heard a pin drop and I'd goose bumps all over. Other songs he played were Primavera, Innocence, Gypsy Music, No Matter where you go, Thank you for Bringing me here, First Light of Spring, City of Chicago, Make you Feel my Love, and THE MOST amazing version of Diamond Mountain (which I'd heard sang before but never like this), I'm a Bogman (which went down well with the Kerry people as did) Acoustic Motorbike, a Cure Song which I didn't get the name of, and many many more songs that I just can't remember. He came back for an encore and after that got a standing ovation and had to come back again to keep the crowd happy as they just could've get enough of him. He was truly in top form and looked as if he was thoroughly enjoying himself. He told some entertaining stories in between songs and had everybody in stitches. I managed to have a word with him after and he said he enjoyed the gig. One word of warning though, if (like me) you were holding out on buying the CD 'til after the concert to get his signature DON'T, as the record shops in Ireland are slow enough to stock his music, he wants people to go in and ask for it rather than buying it after the show. He said he is really excited about playing Australia and the next 18 months of touring. All in all it was my most enjoyable experience of seeing him live and I've seen him approx. 6 times in Clonakilty, once in Dingle (St. James' Church) and the INEC - Killarney with Christy, but last Thursday night was the most special. I'm envious of those of you who'll see him soon. Enjoy every minute and savour the experience. Well, I treated myself to see Luka in Dublin on the 24th. I had a winter recess from the job, and everything seemed to fit nicely into place. And so there I was, at Vicar St! I flew out of Newark, NJ to Chicago and then on to Dublin, a round-about way, but it saved m e about $300 off the price of the airfare. As I was waiting on the tarmac, looking out the window, I sang to myself "FROM the City of Chicago, as the evening shadows fall....". It set a very special mood for me -- my little joke! Eh, Chicago is quite lovely in the evening. There was a lot of security at Vicar St, and they were very strict about people loitering about the inside door of the venue. But before we were ushered away (into the bar area) we saw Alyanya coming in, as beautiful as ever, with her guitar strapped to her back. What a treat to know that she would be Luka's support that night! As it happened, there was supposed to be 'somebody else' for support, but at the very last minute they couldn't come. So Alyanya was implored upon to save the day. And Alyanya came through with flying colors, of course, singing with her lovely voice her lovely songs. I was sharing a small table with 3 young people, and the one girl was tapping her friend on the shoulder, saying "Settle down, be quiet, this singer is really good!" The venue was full, but not unbearably packed. And it definitely was a crowd that knew Luka and had seen him before. I did not get the impression of any 'newbies' or 'Luka virgins'. I had purchased a single ticket, and was looking forward to mingling with the Dublin audience and getting the Luka feeling. The crowd was very excited for Luka and welcomed him onto the stage with much enthusiasm. I was very pleased for Luka -- he deserves a big, warm, welcoming crowd! And, he was very at ease with the crowd, looking all around, at every row of seats, up and down,--- a very special technique he has! But, in a smaller venue, when Luka looks into the crowd, he is able to catch your eye and is looking right at you, and you know it, ha ha! So, happy for him when the crowd is large, but happy for us when the audience is small! Also, because the crowd was so large, I think he did not come into the lobby after the show for this reason. So, no signing of CDs at Vicar St. And, this may have to do with security reasons, as well. I suppose the venue didn't want hundreds of people milling about ! The show itself was much as Gill gave forth in the lovely review of Killarney. Luka opened with Sunny Sailor Boy, but not too many people singing U wah U wah! He did much to encourage it, but only a small percentage gave him the satisfaction of singing along! And then a guitar solo (She Moved Through the Fair?) which beautifully flowed into First Light of Spring. Whoa! That was breathtaking! And when finished with First Light of Spring, with great care, back to the instrumentation. I was ready to jump to my feet for this, as the arrangement was tricky and very well done. Alright, I will use the word 'stunning'!! Then, many songs from Innocence. I would say the crowd was not very familiar with these songs. But we fans who were lucky to see Luka last year as he was composing and learning these songs of course knew them all! He snuck in between the Innocence songs I Am Not at War With Anyone. I was very moved and did not want to blubber, cry and sob in front of my companions! But, as an American, this is a very wrenching song, and I broke down and cried the first time I saw it on the website. This time, in Dublin, I felt just as bad, being aware of the sentiment towards America and the war. I had a good seat, several rows back, in the middle. A good view of comings and goings, that is, of the exact moment when he entered the stage! I was wondering what his 'costume' would be, you know, the clothes he wears for performing. He wore jeans and the short sleeved black shirt, much the same as he wore the first time I saw him live at the Bickford Theater in May 2003. Last year, with new songs and new image, he was wearing the brown pin-stripe suit. Very handsome in it, too! But I can see that music and performing are different in Ireland, at least on my short visit to Dublin, as compared to the expectations of an American audience. In Ireland, casual dress is the name of the game! In fact, when I came home, my sister asked me How do people dress in Dublin? In America, we rather like our entertainers to 'dress up'. Last year in 2004, Luka's performances were done sitting down on a drum stool, although how this is comfortable I'm sure I don't know! It suits his new attitude and style, althought some fans bemoan the loss of the standing up, jumping up and frenetic guitar playing. So, imagine the supreme excitement when he was called back for the encore and he played them standing up, like the good old days! I saw it as the best of both worlds in one concert! So, the encore was: Here and Now, The Acoustic Motorbike, and Bogman. Goodbye again.... and the crowd called for more, much clapping and whistling and woooooooooooooooo-ing, but no standing ovation. Hmm, don't know why.... His last song was Don't Be Afraid of the Light That Shines Within You. He did sing this at the Bickford in 2003, and unplugged the guitar and walked up the aisles of the theatre. That old audience was in awe. Of course this was not possible at Vicar St! But he did teach the song to the crowd to sing, and again, they are a rather quiet crowd, I don't think shy, just quiet. He couldn't hear us, so he called to Paul to turn down the volume of the guitar. Oops! The guitar got shut off altogether! So Luka held the guitar up to his own microphone to catpture its sound, but it really didn't work too well that way. But it was a most noble effort from a gentleman who had the audience in his care, and for this girl, it endeared him to me even more. I will keep a picture of that in my mind for a long time. The bouquet of flowers was beautiful and very large. He did give that away to someone that he could reach to, although he pretended to try and throw it. There was a full moon that night of Feb 24, but it was bestowing its blessings unseen from behind a thick cover of clouds. Nonetheless, we revelled in Luka's songs all the way back to our hotel. But here is the high point of my trip: I flew out of Dublin to Heathrow (and then on to JFK). On both of these flights as the plane is boarding there is overhead 'piped-in' music. It's just like, so annoying -- all this background noise! And the songs were a terrible mix of terrible music and sitting at Heathrow I just sunk my head in my lap and thought "That will be the day when a Luka song is played in this manner". And then, the faint strains of a guitar that I knew... I jerked my head up....! It actually was Sunny Sailor Boy being played by Himself! I sat up straight, hips shifting along.... and wanted to shout "It's Luka, it's Luka, it's Luka!!!!!!!!!!!!!!!!!!" I still marvel that there was Luka played in this manner! This is the first light of spring, my loves! First the Venue: This is the very first time I have been to The Basement and I got a bit of a surprise. Going back to the 70's the place was depicted as a crowdy, noisy, smoky place to hear great jazz. I was expecting a bit more bohemian, maybe even a bit of saw dust on the floor. Perhaps the 80's brought it up a notch with the stockbroker/IT "Suits" making it very popular as a TGIF Drinking Hole as well as a venue for visiting artists. The doors were still shut when I got there just after 7pm. A few were there sitting on the steps and after a few hard knocks on the door, we were let in. The place was like an up market pub, plenty of wood and the areas looked well planned out. The bar was in the middle with a snooker room off one side and the other standing room and then a step down to the table and chairs area. This is where we sat and where ever you where in the room you had a good view of the stage. Thank goodness we had first sitting at 7.30pm. Some poor souls were still waiting for their mains at 9pm. The food was good if a bit cool, but with my mushroom roulade and the barramundi fillets was fine. We saw Amanda Keller (a radio and TV personality plus Angela Catterns from the ABC. Need I say that Angela did not do her normal Breakfast programme this morning. I was wondering how she was going to get up at 4am after getting home in the wee wee small hours. Hardly worth it. She could have just gone down the road and started work. Then about 10pm The Man himself appeared. Just as relaxed as ever, ready to swing into his repertoire. As I STILL do not have the CD (tried to get it after work) I did not know all the titles. Luka sang 30 songs. The last five were his encore. For his finale we were anticipating the Throw Your Arms etc but he threw in Black Is The Colour and then finished with the former. The night wrapped up around 11.45pm. My friends just had to rush out and catch the last ferry to Mosman and I was not far behind to get the train which would take me in my general direction. Pointless driving into the city unless you want to pay exorbitant parking fees. He kept pretty much up with the list from Brisbane and Melbourne with a few extras thrown in. With Acoustic Motorbike which I really loved hearing live, I couldn't swear but I am sure he put in a few barbs re Sydney streets. Someone has been talking to him. It was a wonderful night. Luka looked great and very relaxed. I always get the impression that even though the tour might be gruelling he really enjoys being here and the audience and loving every minute of it. It wasn't as though the audience was not wanting to let him go, I got the impression HE didn't want to go. I loved the venue, good atmosphere, will go back again soon. The best about last night, it was Non Smoking right throughout the premises. People had to duck out into the street if they wanted to light up. So if he considers performing there again I will definitely go there rather than a theatre. Sandra and I (of course) arrived early and were shocked at the beginning CHAIRS!!!!! for crying out loud, in Fabrik!!!!!!! But then we did not waste time and sat down in the front row, friendly greeted by Paul (great to see you again, GREAT JOB!). So here we were in a packed hot venue and were taken in the very moment Barry started to play, much more energetic than the last times I heard him. I don't want to tell you much about the little stories in between or the way songs were played, you will see it all happening in the next weeks all over Europe. I want to tell you how happy I was, seeing this show and the artist in such a good mood, really eager to play and sing - It was just great. The sound has changed, I don't know whether for good or just tonight, but it was soooo good. Thanks Paul. - And of course again: Thanks Luka for this lovely night. You should have seen the lot, afterwards - serious promotion went on - the artist, the distributor and the label owner - in so many photos were taken. Luka signed CD's after this exhausting and very long concert and I am sure he enjoys a big "apfelschorle" right now. Fair play to him! Last Tuesday I had the pleasure of seeing him play in the Cruiscin Lan, Cork and on Wednesday night in Dolan's Warehouse in Limerick. Even though I'm from Cork I'd prefer Dolan's as a venue, much more intimate and cosy. I thought Luka was in top form, he was so at ease and comfortable and really seemed to enjoy himself. The audience could not get enough of him and I must say I would have watched him play for another few hours if I could. In fact I've come to the conclusion that I'd watch him play forever. He sang this beautiful new song which he penned recently and I'm embarrassed to say I've forgotten the name of. On the Wednesday night in Dolan's he played a beautiful Australian song that he learned for his tour over there as there were a group of Australian fans in the audience. As we'd say at home the craic was mighty and highly infectious and unfortunately the night seemed to end too soon. For all of you in Belgium and Holland who have the opportunity of seeing the great man himself soon enjoy every second. Sorry this is so short but am in a mad rush to finish up in work. We got to the Luka concert in Brugge, last Sunday. We came in right during his first song, and we enjoyed the concert so much I really can't reconstruct any song list. 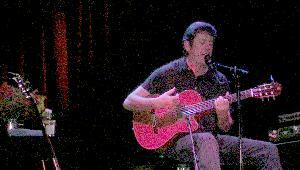 Luka played sitting down, with Coogee, his Spanish guitar [a Fender CG-24 SCE Natural, if you want to be precise]. It was in the middle of the old Burgh of Brugge (not the market square as Luka said, but rather the administrative centre, where there used to be the old cathedral and a castle, blabla). Anyway, lots of old medieval buildings, his stage was right in front of the illuminated town hall, and there was a crowd of a several hunderds. At first, when there was still daylight, some people were sitting on benches and lots were talking or ordering something to drink from stalls in the back. But when darkness fell and Luka really 'dug into' it, people started to sing along really really good (and I mean that) and even swaying and dancing. Anyway, we tried to show the good example. Let's see, we heard songs like I Am Not At War, Innocence, and June (right, in early August, he knows), but some older work as well, performed in the 'innocence' or 'before sleep comes' style, like Rescue Mission, Gone to Pablo, Sunny Sailor Boy or Diamond Mountain (one Australian clapped). And really funny introductions. 'Here and Now' gave goosebumps, because it gained a new meaning after the tsunami. The song really changed after that event, I'll listen to it differently now. Mohammed was right on, and meaningful as well, in a country where anti-immigration politicians rear their heads. And it was beautiful. Gypsy Music did the same. We also had the privilege of hearing the Saint Bridgit song, something he doesn't do a lot. And we heard a new song as well. And tons of other stuff I won't mention just to make you envy us. And because I'm sloppy and forgetful as well. And then. For the encore Luka came back, his chair was gone, microphone raised, and there came Rudy [a black Alvarez DY88BK, in case you actually want to know numbers]. No soundchecking, just a simple "guitar, voice, turn it all up, please". That's when the concert reached a boiling point: Exploring the Blue (with some chord soloing), Make You Feel My Love (or was that earlier in the concert?) and a jumping You Couldn't Have Come at a Better Time. Everyone was having a really great time, couldn't have been better. Anyway, Luka seemed glad to be performing in Brugge, the setting was extraordinary, the crowd sang along like I've never heard before and we had a very good time. See you! 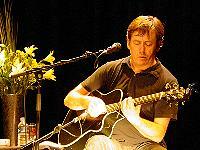 Yet another excellent show from Luka in the intimate setting of the Balor Theatre, Ballybofey, Co Donegal. As always with Luka, it feels as if you're sitting at a small party in a friend's living room and the songs are being played just for you. Old favourites like "Sunny Sailor Boy" with a nice vibe from the audience on the "Ooh Ahh Ooh Aahs", mixed with brand new material such as Luka's additional verses, regarding the removal of yellow school buses, empty, so they wouldn't be damaged in the New Orleans hurricane, on Woody Guthrie's "This land is your land", sat very well together. Luka tried out a few new songs that he hopes to use on his new live DVD - due to be released in 2006 and finished with the last song written by Ewan McColl "The Joy of Living" which he'd just learned and was really enjoying singing. Luka took us from the beginnings of his musical journey in Doolin in 1973 with the German girls with tight T shirts, to the Iraq war with his "I am not at war with anyone" which he'd hoped to sing for a few weeks, but is still singing a couple of years later, via the tragic seige in Beslan, where Luka was moved to write an instrumental as he wasn't able to put the feeling into words, to the now international "I'm a Bogman" with thanks to the Danish girl who gave him the Danish translation. My own current personal favourite is Luka's version of "Make You Feel My Love" - his song to sing at weddings. He never did tell us which song he sings at funerals! Roll on the 2006 DVD, and all you on mainland Europe, go straight to www.lukabloom.com find out where he's playing near you, and treat yourself to a laid back, chilled out night. This was Luka's second visit in Finland within one year. Just one year ago he made three concerts, also under headline of Irish music-festival which is an annual event in Finland every autumn. The venue, Tavastia is a traditional rock-club so I was a bit excited how it might suit for Luka and his music. Last year I saw him performing in Kerava at a concert-hall and I liked that moody and quiet athmosphere. First the speakers asked people to smoke in the bar and they got applauses for that. 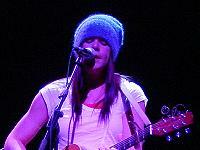 Opening band was called Jane Raven. I didnt know anything about this Finnish group. Their music was country-pop with Irish influences. After that, 15 minutes for roadies to put everything ready for Luka. Table with a bunch of flowers on the stage and a wine-red velvet curtain on background, that was all. Luka came to the stage and directly got applauses, took his Spanish guitar and started to twang a beautiful melody of his first song. Sound was great (despite of small humming-problems in the beginning), his voice was ok, audience was silent and excited. Luka seemed to be in a good mood and during the songs he chatted gently, told the stories behind these songs etc. He got some laughs because of his jokes and good humour. Some conversation with people too, about similarities between Finnish and Irish people ("we love to suffer"), about the Cure and Robert Smith, politics etc... The audience also had a chance to sing chorus during "Sunny sailor boy", "Dont be afraid of the light" and "Rainbow day", and Luka was very pleased for that. I was surprised to see how hard he could hit his quitar, so much energy on some songs (thanks to the sound man because of the mellow and magnificent sound!). The show lasted nearly two hours and people wanted more and more. Unfortunately after four encore songs the concert was over. He threw his flowers to us and waved goodbye. Best gig yet. Longest gig yet! Thirty songs nearly! Fair amount of people in attendance, it filled up very fast and after a bit of jockeying for position we were rescued and waved upstairs to huddle in a corner of the balcony. Fine by me, as I have the uncanny knack of standing behind or under very very tall people. Saw and said hello to Alyanya who is still lovely and delightful! Eithne Ni Cathain warmed us up, singing very lovely sean nós tunes plus a few folky ones. I have to say she seems much more comfortable and sure of herself when she's singing in Irish rather than in English though I would think that it has to be a bit nerve-wracking to not only open for Luka but also open for Luka at Whelans, so fair play to her! Lovely voice, lovely songs. The last song which had a title that was Irish for 'prayer' (not going to try and spell it) was very beautiful. As you can see this was a neverending night of brilliant music. The saxophone (or 'the thingy' as I called it later, because I couldn't see him) was an excellent touch, what an amazing addition that was. That's something we don't get much of at the shows in the states, understandably of course - but it's wonderful to hear little surprises like that. 'Love Is a Place' with the sax was the best performance of that song I've ever heard. The new songs were great. A couple of them I have heard, as far back as two or three years ago in San Francisco ['The Light Inside'], but one I had never heard before, the one I wrote down as 'There Is a Time'. Lovely song, lovely. It's very interesting to see Luka with a proper Irish home audience. The Helix was a great event, but the crowd was a very mixed one - described by many as a sort of musical UN summit. Whelans was Irish, and Dublin with a few folks from the rest of the country thrown in here and there, and that made it an excellent sort of a party atmosphere. It really did feel like a session in a living room, Luka and a few close friends and family. There was a very silly but joyful attitude in the room - like McGann's in Boston times ten thousand. And in half the space! Whelans is tiny! 'Bad' was outstanding, with the entire room joining in to sing it. And, er, it was played for 'a woman all the way here from America, who's fresh from her 47th U2 concert, but this is her 50th Luka Bloom concert so she's got her priorities straight.' The crowd laughed, and some joker shouted out "PSYCHO!" which is fair enough, I suppose. Then Luka said, "I'll play the song for you but so long as you don't start stalking me!" Ah, a bit late for that, I suspect. Er. Right. But the whole room lit up and sang the song and really, it was magical and it's very nice that Luka played it because I've never managed to get U2 to do it! I wandered Wexford for a while, because the show didn't start until 23:30. Wexford is a nice place. The people are very friendly and there were nice shops and pubs, and the whole place is right on the water. The bus journey there, while long, was in fact rather beautiful. Rolling green hills dotted with stones and sheep, with the odd glimpse of village and sea between the trees. And with the opera festival going on in Wexford there was loads of art on display, opera could be heard in the streets and all the pubs had live music going on inside them. And it wasn't too crowded, which was also a relief. Finally, I made my way to the theatre and bought my ticket. The show had a standard set though Luka seemed determined to win over the odd crowd with particularly funny introductions to songs and by keeping things at a quick pace. He didn't play too many slow songs - it was very late! - and the fast songs seemed even faster. I have decided that 'Lonesome Robin' is one of my favourite songs, because the guitar is just so lovely and the words tell such a compelling story in a simple way. I'm very glad he's started playing it - I've had it stuck in my head since Doolin! And we got 'Bogman' - for me it was the first time in ages that I've heard that song live, and it was brilliant! With the first chorus in Finnish no less! All in all a lovely concert, stark contrast to Whelans which was more or less a big party. This was a proper sit-down sort of a show and while the audience was very reserved (only a few voices raised for 'Sunny Sailor Boy'), they did laugh in all the right places and they were properly appreciative of the songs. I saw quite a few CDs being sold in the lobby afterward! After my first impressions of Luka from a Promo-CD of Boston Acoustics (for demonstrating speakers) with some songs of the Riverside-Album, I joined him for the first time live on the 5th of April 1990 in the 'Live Music Hall' in Cologne. What an incredible experience that was for me! Then I went to every gig of Luka in Germany, that was possible for me over the following years. The last gig before the Savoy I've seen was on the 24th of February 2002 in the 'Grosser Sendesaal' of the WDR in Cologne. So it was a long time I wasn't able to enjoy Luka live. For all the times between the gigs I can only enjoy all of his albums on the cd, wich I proudly all own. Every time since the first time I saw Luka live, I brought one different friend to his concerts to infect them with the Luka-Virus, too. So I came to Düsseldorf with my good friend Andy. The location was very nice, but the crowd seemed to be very lazy, maybe this was about it was Sunday evening? The gig was very nice and the mood was quiet and relaxed. The opener John Spillane was funny and preparing well for Luka. 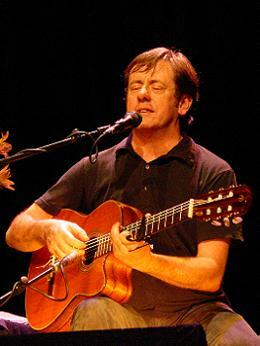 My thought as a musician by myself, too, was that John Spillane played his guitar not very clean. Maybe it was about he was nervous, maybe he can't play better, I don't know. If the chance will be there, I will think about checking him out on another gig. But anyway, just as Luka came onto stage, I had forgotten all about this stuff. Relaxed, funny and friendly he opened with a little personal story about the actually situation all around the world, the wars and the nonsense politics and how he wrote this special song this one morning. Then he played this song called "I Am Not At War With Anyone". Together with knowing about the birth of this song, I had tears in my eyes while listening to this fantastic song. This is how I know and love Luka. I didn't know this song before. Following he played some of the newer songs: "Open Up Your Arms", "There Is A Time", "June", "Innocence", "Lonesome Robin", "Gypsy Music" and "Blackberry Time". Then we heard "Diamond Mountain", "Love Is A Place I Dream Of", "Make You Feel My Love" and "Sunny Sailor Boy". All the people were now under Luka's spell and deep inside this own world of music and dreams. The mood was very silent now, except of the singing together on "Sunny Sailor Boy". Me, for myself was sitting with closed eyes and slowly carried away from Luka's music. While he played "In Between Days", "Peace On Earth", "Thank You For Bringing Me Here", "City Of Chicago" and "No Matter Where You Go, There You Are", I was just sitting there in this theater and forgot about all the problems we all have every day in our lives. After the regular set, he played for bonus "Exploring The Blue", "Gone To Pablo", "Love Is A Monsoon", "You", "True Blue", "Black Is The Colour", "I Need Love", "Rainbow Day" and "Water Ballerina". Of course, this last set included some of my very favourite songs of Luka, so I was in heaven now. When Luka ended this gig, all of the people, including myself, seemed to be be sad that this evening with Luka was over now. But anyway, some time later I sat in my car on my long way home and was feeling very happy, still dreaming of going to Ireland some day and enjoy Luka in some pub in Dublin, listen to his music and after this, sit and talk with him. John Spillane entered the stage in D�sseldorf for his 30 minutes interlude with the words that he was not Luka Bloom but John Spillane and he managed perfectly to get the audience into the mood for a nice Irish evening. To start as a pre-act must be a thanklessly task, but John did it very well. Still talking to anyone behind the curtain, Luka entered the stage smiling accompanied by a cup of tea. 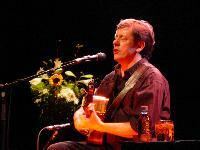 He said that he was not John Spillane but Luka Bloom... and started the evening with a local joke about the rivalry between the cities Cologne and D�sseldorf. Then he sat down and looked around into the audience carefully, contacted the faces around him and we felt very welcomed and introduced. The old Savoy cinema, now used as a theatre, was not sold out, but this cannot be blamed on Luka. The acts in this place will not be announced in ads, normally. 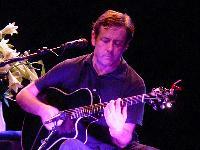 Luka made his best and his songs were intensive and strong in the very relaxed atmosphere. I never heard it so simple and clear - the simple words of a simple man who could be living in any part of the world. Luka showed at any time that his heart belongs to the whole world - he writes about the ceasefire of the IRA, about what happened in Beslan. 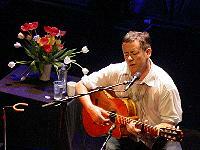 He sings about love in general and about women in particular, about his homeland, about rain and about children. His singing and playing is so unique and strong that every song seems to be his own - even if he sings a song by "The Cure" (In Between Days). His show is condensed to the only important thing - music. Only some light effects on the stage and a bunch of flowers on the table behind him. The audience sat down relaxed and listened. It was a Sunday evening and regarding to Luka 'all had a very strained weekend' and that could be the reason for the very elf-like chorus coming from the rows at Sunny Sailor Boy. It could happen that the main part of the audience did not know all the songs, but I am sure, after this concert they all got at least one CD of Luka. After a short break he snatched our illusion he would have been changed his clothes for the second part of the show - in his words he was just taking a leak. His straight appearance and his presence on stage brought the irish feeling to the audience and he allowed us to take a look into his world. Between his songs we learned that time is also running in Ireland. The business has come to the island and meanwhile exhausted Irishman will come over to Germany for some relaxing days. After some extensive and obstinate demanded encores Luka left the stage with the flowers in his hands. We promise to take our family and friends to his next concert and we will occupy all the red fluffy chairs at the Savoy Theatre. Well, let's start with the support act. I wasn't really impressed by this young lady. Thought her music was quite depressing and found it hard to tell the difference between some of her songs. But then Oosterpoort is not really a nice venue. It's quite big and has a cold atmosphere. Very hard for a young singer, so I'm wondering how she will sound in Utrecht. stuitje voor de Nederlanders). He did move a bit difficult. to the next. I really had to switch, but it was an impressive combination. Of course he told a lot more stories and made several jokes. I found the setlist real nice with songs from all over the years. Luka didn't have any problem with the venue and made a very strong impression. So it really was a wonderful concert!!! Looking forward to Utrecht! Sitting with a little drink and a new found friend (Anna is spending the night at my place) and we just returned from the concert and wow DID YOU MISS SOMETHING!!!!!! I haven't seen Luka like this for years (well maybe Deventer came close). Yesterday I already knew his voice is really good at the moment. He was so there!!! But first things first. His support act Sabrina ... was really good tonight. Her voice came alive today. So very different from yesterday. Still the music is a bit too sad for my taste, but what a difference. 2) There is a time (a new song for me and quite a difficult one. So what else to say. Said enough. Let's give Anna a chance. I have never seen Luka in a place so big before, first of all. We Americans get him in tiny pubs (which is nice, because you're practically in his lap and well, who's complaining about that?) or clubs (not so nice, sometimes) or the occasional church (there once was a man from Nantucket...). We don't get the big theatres very often, so it was particularly amazing to see him in such a large space, full of people! Second, he was in fine form tonight. Jael (who is kind enough to put me up for the night so that I do not have to make the trek back to A'dam so late) has already posted the set list so I will just add my own crumby interjections. Aren't you all lucky? Yes, you are. Ken the sax man is brilliant. He plays as if he's dancing around the song, looking for a place where it'll let him in, and he slips in quietly and pulls the music in around him. It's wonderful. I especially liked 'Miracle Cure' and 'Peace on Earth' - but 'Gypsy Music' was the jewel of the night. The two of them worked some kind of strange magic on that stage. You could "feel" it. Himself looked a little stiff tonight, indeed he did take a scary tumble down a flight of stairs earlier in the week, and as a result he's rather achy in the nether-lands. (Har har.) Having fallen UP a flight of stairs two weeks ago in Eindhoven, I can empathise. Ouch. Didn't slow him down at all, however - because in addition to blistering versions of 'Rainbow Day' and 'Here and Now,' we also got 'Te Adoro' which I don't know that I have ever heard before. I really like the Dutch audience, because they really and genuinely like him. The place wasn't sold out but you wouldn't have known it, from the response and the participation. It was wonderful. I can't wait for Eindhoven. That's going to be one hell of a show. Tonight's room was smaller than last night. It made it a much better atmosphere I think, and also it wasn't so bloody COLD. Vredenburg was freezing to the point where I put my wool jumper back on halfway through the show. Tonight was toasty warm and cozy, and the audience receptive if a little timid about interaction. I'll let Rena post the setlist, but I have to say this: LISTEN TO THE RIVER. This was the first of his songs that I knew all the words to, because it is quite possibly my favorite song he's done. I grew up surrounded by rivers, which is good for a little fish like myself, and as a child I spent many days splashing around in them. I also listened to them, at great length, and throughout my life I have lived on or near some of the great rivers of America - the Mississippi, the Hudson, the Colorado - and each of them had something different to say. There's a great deal to be learnt from the whispers of the waters around us. Anyway, all poetic wanking aside, he promised he'd play it and play it he did, and it was lovely how he got the audience to hum along. As I said they were a little reluctant about the whole 'audience participation' deal, but in the end it sounded simply marvelous and I am so, so very glad that I didn't miss this show, and I finally got to hear it. Kenneth Edge joined Luka again for several songs, and I have to say that hearing the two of them live on 'Primavera' and 'Gypsy Music' have really taken those songs somewhere else for me. And there was a surprise tonight of 'The Parting Glass' which Ken played solo before 'Love Is a Place'. I don't know how the man does it (he credits Paul the Amazing Technicolour Soundman, but I know better) but he managed to make the sax sound for all the world like a tin whistle that was pretending it was a sax. It was absolutely fantastic, and quite a few jaws met the floor by the end of it. I sat next to a lovely couple, who were very nice in letting me take up an empty seat in their row so that I could be near my friends Martine and Thomas, who had never seen Luka live before. I love bringing new people to his shows. It's always a treat to watch their faces from song to song, and there's a selfish little moment of triumph when at the end they are on their feet with the rest of us, clapping and calling out for more. They come in liking the albums but they leave loving the songs, and that's the whole point of it, isn't it? Out of all the shows I have seen in Europe, I still think Whelans is likely the best one. The energy that night - it's a bit untouchable and probably unfair to put any other gigs up against it. Dublin aside however, Eindhoven is up there. Definitely up there. It was very miserable weather when I started the 40 minutes drive to Leopoldsburg last night but from the moment I turned on the engine of my car I felt like the king of the world. It had been exactly a year since I last saw Luka and I couldn't wait to see him bashing and caressing his guitar again. With the great reviews I had read from the Dutch concerts but also with his fall on his backside in the back of my mind I approached Leopoldsburg. Was he going to be able to perform and if he did would he be alone on stage? Sabrina Dinan who played the support was a great musical surprise to me. She definitely has the prospect of a fine career. She has the ability to play in the same league as Gemma Hayes, Cara Dillon and all the other great female singer-songwriters Ireland produces. After a 15 minute break the man himself took stage. He looked very energetic and ready to go standing up. Sitting down was another story. You could tell he suffered finding the right sitting position. "Joy Of Living" was the highlight for me. He dedicated this song to George Best who past away last week. As a true Manchester United fan I had difficulties keeping my eyes dry. Rest in peace Georgie!! Good to see him mixing up his guitars again. I've a soft spot for the black one. Hopefully for Luka the pain gets bearable very soon so he fully can enjoy the respect and appreciation he gets from the Flemish public. I drove back to Antwerp as a happy man in the world. What a difference a few days can make. Leopoldsburg was a solid and enjoyable gig but this was first class musical ecstasy! Dendermonde made Luka feel at ease and it showed. But first I want to praise Sabrina Dinan who once again did the support. For me personally she can be Luka's support forever. Chances are however that she's going to big herself. Last night she finished off her set with a cover of Coldplay. Breathtaking and goose bumps everywhere. The man started at 9pm and at 11pm he was still going strong. The comfort cushion on his seat wasn't there anymore so I hope that this means he's recovering from his fall in Amsterdam. There were so many highlights and funny remarks that time flew by very quickly. But I'm especially grateful that he played Joy Of Living, Listen To The River, City Of Chicago and the medley Black Is The Colour, Te Adoro and True Blue at the end of the concert. Once again driving home as a happy man in the world! The first time I saw Luka was in Ostend, it was a free gig in open air. It started quite slow but as it began to rain and the people went home Luka got excited and the fire from his guitar and voice warmed all who persisted in standing in the pouring rain. That evening I fell in love. 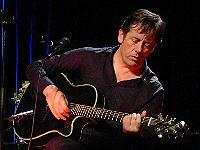 Now last Thursday I had the chance to see him again in Dendermonde. I had the perfect spot: first row, centre. He came onto the floor, looked right into my eyes and started what I felt like a private gig and it was beautiful. He stole our hearts with a few Dutch words: "Goeie avond Dendermonde, uitverkocht" and we were all not at war with anyone. I can't tell you the rest of the play list, I was just enjoying with Goosebumps all over me, and I think Luka also enjoyed it because he played an hour longer than planned and added some more when we gave him a standing ovation. I wouldn't have minded it at all if he had gone on all night! Next morning when I woke up with the Dendermonde Blues (Luka had been improvising on stage because he really liked the sound of the city name) and I knew for sure, I'll never miss another chance to see him again! Little anecdote: This summer I had the honour to hand over some flowers to Christy Moore, after a concert that had brought tears to my eyes. So when Luka pushed the big bouquet of flowers in my hands right after singing City of Chicago (I didn't know he's the writer of that! ), this gig became just perfect and one of the best I've ever attended! I discovered "the Irishman and his guitar" in the early nineties. 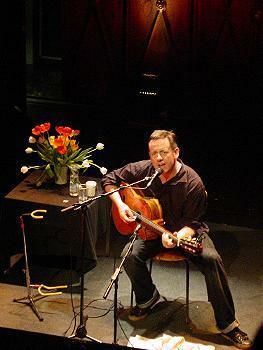 At that time I used to go to the Dranouter Folkfestival (Belgium) with some friends, but never had the occasion to see Luka Bloom live. Only 2 years ago, I went to a concert of him in open air. That was a great show, but I preferred this more intimate gig in Dendermonde. It was good to see (hear!) that he keeps bringing this message of respect and tolerance. His enthusiasm, be it in his music or in his permanent call for justice, works inspiring. In brief, for 2 hours, Dendermonde has been warmed by a "little Irish fire". Standing ovation followed - you could see and feel that Luka was absolutely overwhelmed! Again standing ovation - Luka looked as if he couldn't believe it! and I felt very happy for him and I thought that is really what he deserves for this outstanding concerts.